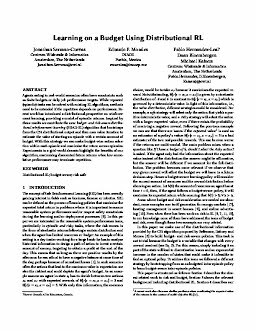 Serrano, J, Morales, E.F, Hernandez-Leal, P, Kaisers, M, & Bloembergen, D. (2018). Learning on a Budget Using Distributional RL. In Proceedings of Adaptive and Learning Agents (ALA) Workshop, 2018.